Redclaw Top Lift Pot has 4 funnel entry which is constructed from 8mm solid Galvanized rings, alumininm posts, stainless funnel rings & door hook. This pot also has large door in top for easy access & folds up flat for easy storage. 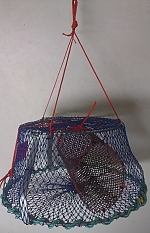 This new pot also has been constructed with heavy duty net. The Redclaw Pup Pot has 2 funnel entry which is constructed from 8mm galvinised steel and has Stainless funnel ring & door hook. This pot has a lage door in top for easy access & folds up quick for easy storage.